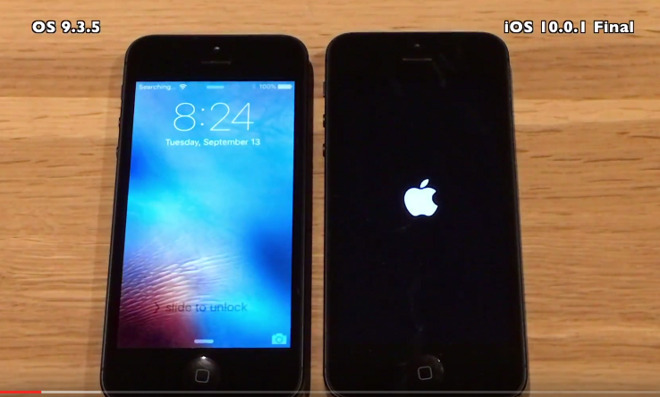 A series of videos published on Wednesday suggest that Apple's new iOS 10 offers relatively smooth performance across iPhone models, even ones as old as 2012's iPhone 5. The only major difference between iOS 9.3.5 and iOS 10.0.1 is boot times, iApple Bytes observed. In testing the iPhone 5, a model with iOS 10 took nearly 15 seconds longer to boot. With the iPhone 6s, that gap shrank to 3 seconds. Scoring using Geekbench and Basemark OS II did show performance hits, but relatively small ones in most cases. In hands-on tests running apps, there appeared to be little visible difference, though iOS 10 did create mild lag —for instance when using Safari or other graphics-heavy apps. The iPhone 6 and 6s run iOS 10 "very very smoothly," iApple Bytes commented. Apple has regularly faced criticism for the speed hits newer versions of iOS can create on older hardware. As recently as December, Apple was targeted with a lawsuit arguing that iOS 9 rendered the iPhone 4S unfit for daily use, causing not just significant slowdowns but poor touch response, and even freezing and crashing. Apple knew iOS 9 could cause problems, the plaintiffs suggested, but benefited from not-so-subtly encouraging people to buy newer iPhones.